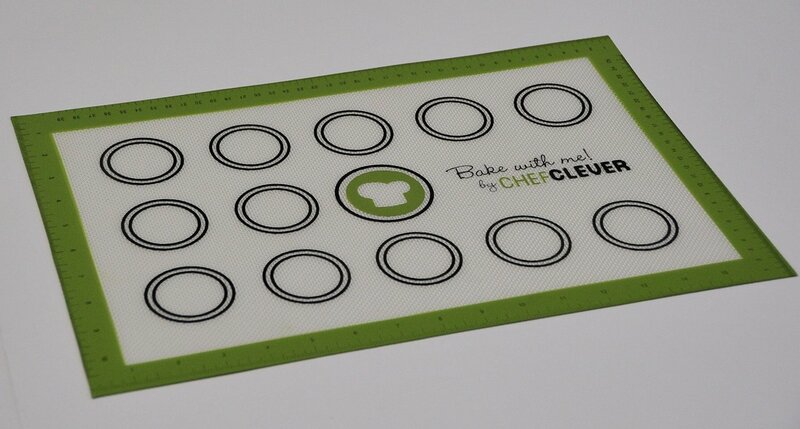 I just tried out Chef Clever Baking mats! I LOVE to bake so I was super excited about trying out this fun bake mat. It is super cute and so convenient. It’s non-stick so no need for cooking sprays or parchment papers! Plus no scraping the pan when you are done just throw the mat into the dishwasher or sink and your good to go for next time! I am in love with these baking mats, a must have for all your baking friends & family! I also use these mats for things other then cooking. For example, I just made some peanut clusters and I used the mat to make the peanut clusters and cover them with chocolate. I let them air dry on the mat and it was great. No sticking! I usually lay out parchment but then have to spend a bunch of time removing the paper when they are done drying, with the baking mat I had no problems they came right up! This set of baking mats is really neat because they have the circles drawn out for you so you can really get that perfect circle, make sure your spacing is perfect. It also has a ruler on the sides of it so if you are measuring things you have it right there and super convenient! ✓ THE REAL QUESTION. WHAT MATTERS MOST TO YOU? 100% BPA FREE Bake with Me TM Technology! Exceeds FDA Requirements, Won’t Break Down into Chemicals in Your Food like other brands, and is the ONLY Certified, Proven Solution that Conquers Health, Environmental Friendliness, Style, Functionality, Easy-Measure Technology and Everything that Matters Most to You. Guaranteed. ✓ TOXIC ABSORPTION FREE GUARANTEE, BACKED BY CHEMISTRY. Don’t be fooled by marketing. Every silicone baking sheet breaks down chemically above 450*F, no matter what they say, some much lower. Chef Clever Silicone Baking Mat keeps you safe while allowing you to cut back on butter or eliminate oils all together by using premium, professional chef grade materials. ✓ STOP SCRUBBING. NOTHING STICKS. PERIOD. With 100% NO-SCRAPE GUARANTEE! Chef Clever works with industry experts to develop the latest, most advanced silicone non-stick surface meaning you’ll see even the stickiest cheese, and baked on family favorites slide off saving YOU time and money. Doesn’t it feel nice knowing we’re confident enough to let you try our products, and prove they work before you commit? We think it’s the only way to do business. ✓ MEASURES ABOVE THE REST so you’ll know exactly where to place every cookie, macaroon, pastry and delight before it’s too late. Say goodbye to sloppy, run together goodies, and hello to mouthwatering perfection without the guilt. ✓ WHEN GOING GREEN ISNT ENOUGH. At Chef Clever we’re more than health conscious. We’re conscious of how our practices impact our planet, families and animals, so we minimize environmental impacts while reducing the carbon footprint waste normally caused in your kitchen. Say No to Parchment Paper, and Yes to Planetary Well-Being by investing in Bake with Me TM today.